BATMAN WEEK – Holy Adam West! Today I read an article in the New York Times that suggested that we make all of our important and meaningful friendships in our teens and early twenties. I made one of mine at an even younger age. If you are British, reading this, and of a certain age you’ll like have a favourite portrayal of The Doctor from Doctor Who, and it will probably be the first one you saw as a child. Sure, I enjoyed the work of David Tennant, I love the maverick genius of Tom Baker, and Matt Smith may well be the best Doctor I have ever seen – but Sylvester McCoy is my Doctor. The gruff, paranoid time-traveller with a Scottish twang that mesmerised me as a 7-year old will always be my favourite. So it goes with Batman. While Christian Bale may be an the ultimate Caped Crusader for Christopher Nolan’s Dark Knight trilogy, my Batman is, and always will be, Adam West. My memory is almost certainly playing tricks with me – but all I remember watching during my summer holidays between the ages of seven and eleven was Batman. The Caped Crusader dishing out justice 25 minutes at a time to some of the most outlandish villains I had ever seen. Cesar Romero’s Joker thrilled and terrified me in equal measure (although it wasn’t until a couple of years ago that I discovered he didn’t shave off his moustache, and simply painted the greasepaint directly over it), while my first guilty carnal fires were stoked by Julie Newmar’s Catwoman. Everything about the show blew the mind of a young man growing up in a small Devon village. From the opening blast of the iconic theme music, which I’ve now discovered as an adult is brilliant fun to blast out when driving – to the explosion of colour onscreen in almost every frame. 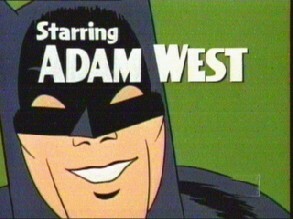 The plots are downright hokey at times, but the charm and charisma of Adam West meant that even some of the worst detective plotting went unnoticed by my tiny little mind. Commissioner Gordon: It could be any one of them… But which one? Which ones? Commissioner Gordon: You mean where there’s a fish there could be a Penguin? Robin: But wait! It happened at sea… Sea. C for Catwoman! Chief O’Hara: All adds up to a sinister riddle… Riddle-R. Riddler! The camp 1960s Batman may look ridiculous now. You barely see a punch connect in the fight scenes, and every cliff-hanger leaves Batman facing certain death only to escape 20 seconds into the next episode with a deus ex machina that would put Matrix Revolutions to shame (my favourite being the Batrepellant for sharks in the movie – compounded by the fact that the Batcopter has 3 other repellants designed for different dangerous sea creatures). But none of this mattered when I was in primary school. All I knew was that Bruce Wayne was an honourable gentleman who quoted poetry, and Batman always beat the criminal with cunning, panache, and a great line in quips. He was clearly a liberal as well, with his belief that criminals could be rehabilitated (although maybe he was just trying to get into Catwoman’s pants) and he never carried a gun or killed any of his adversaries. He always seemed to turn the other cheek, and had a lesson for us all. The TV show taught me everything I need to know about morals, justice, science, and wooing woman. If Jesus wore a cape and drove the coolest car I’d still be going to church every Sunday. 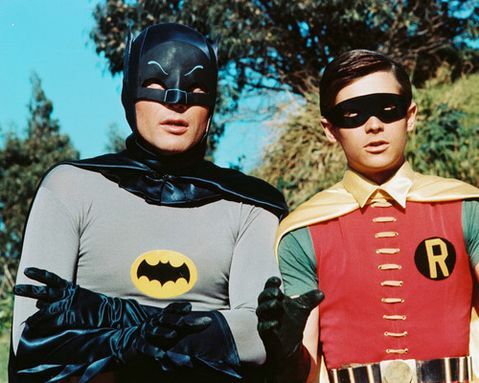 One of the great pleasures in life is watching the Blu-ray of the 1966 movie and listening to the commentary by Adam West and Burt Ward (who played Robin). At one point West even talks about Batman as being ‘the theatre of the absurd’. It’s great to hear an actor talk so fondly of the role that both launched and effectively throttled their career. He doesn’t seem to have changed a bit. It’s a shame the world has.